A History of Twentieth-Century Music in a Theoretic-Analytical Context is an integrated account of the genres and concepts of twentieth-century art music, organized topically according to aesthetic, stylistic, technical, and geographic categories, and set within the larger political, social, economic, and cultural framework. While the organization is topical, it is historical within that framework. Musical issues interwoven with political, cultural, and social conditions have had a significant impact on the course of twentieth-century musical tendencies and styles. The goal of this book is to provide a theoretic-analytical basis that will appeal to those instructors who want to incorporate into student learning an analysis of the musical works that have reflected cultural influences on the major musical phenomena of the twentieth century. 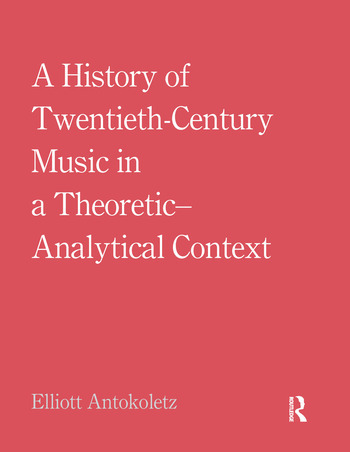 Focusing on the wide variety of theoretical issues spawned by twentieth-century music, A History of Twentieth-Century Music in a Theoretic-Analytical Context reflects the theoretical/analytical essence of musical structure and design. Elliott Antokoletz is Professor of Musicology at the Sarah and Ernest Butler School of Music at the University of Texas at Austin.